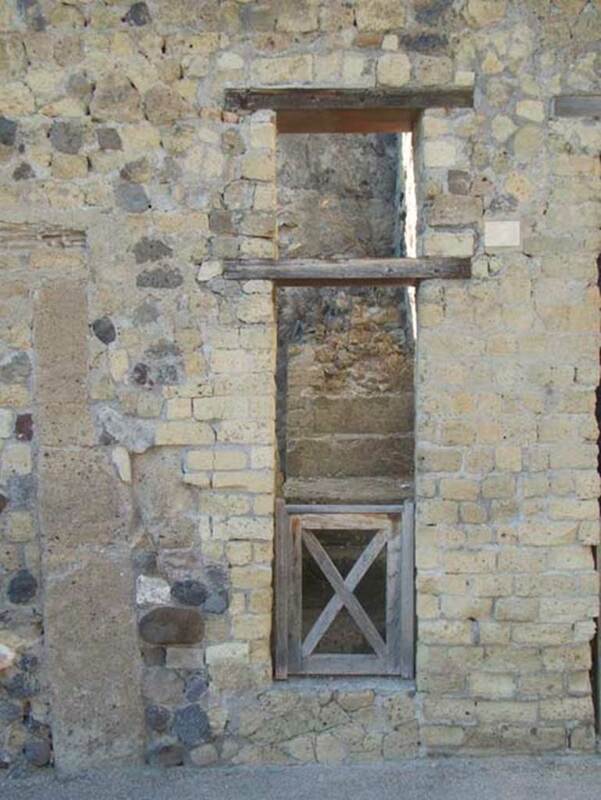 Herculaneum VII.5. Steps to upper floor, above the so-named House of Galba. According to Cooley, thirty-two tablets were discovered on a balcony next to the House of Galba (they say at VII.8 or 9). 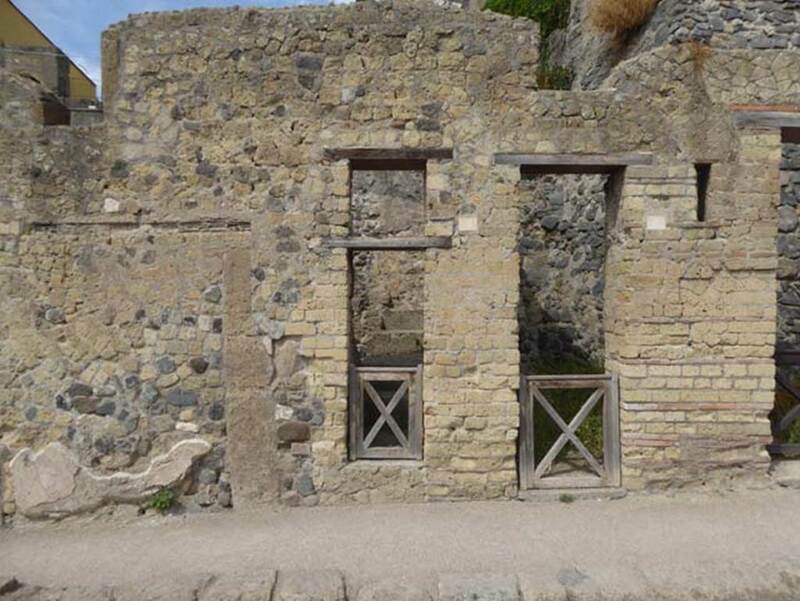 VII.6 Herculaneum, on right, then VII.5, VII.4, VII.3, VII.2, VII.1 and then crossroads with Decumanus Inferiore. May 2010. Looking south along Cardo III Superiore. “Before leaving the town proper, we must say something of the small portion excavated in the nineteenth century, and still exposed, often called the “Scavi Nuovi”. See Waldstein, C. & Shoobridge, L. (1908). 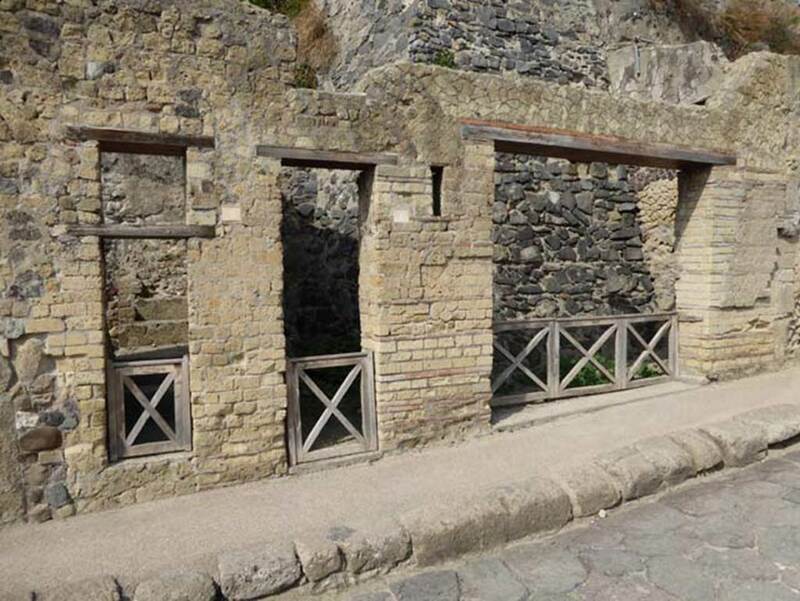 Herculaneum, past, present and future. London, Macmillan & Co. Ltd., (p.76-77). See Ruggiero, M. 1885. Storia degli Scavi di Ercolano ricomposta su’ documenti superstiti. Napoli. (pp. xlvi-li), for the whole description of “Scavi Nuovi”. “The whole of sea street was strewn with fragments of bronze statues, human and equine, of various scales and there was also found a small silver bust of Galba, in tiny fragments, now carefully put together and in the Museo Nazionale”. (inventory number 110127, and see p.659 in Ruggiero, Scavi, etc., (record of 11 September 1874). This portion of the site had been considerably tunnelled by the eighteenth-century excavators, and many of the larger works of art had been removed. However, a marble bust, several pictures and a number of bronze statuettes were unearthed, and an almost bewildering number of domestic antiquities of the highest interest. These included not only fine bronze and clay vessels but a great variety of wooden objects: for example, a wooden chest of drawers, with bronze fittings, unfortunately empty. (See Ruggiero, Storia degli Scavi…. p.588, May 14 1869). There were also found a quantity of nets, ropes, cords, eatables, etc. See Waldstein, C. & Shoobridge, L. (1908). 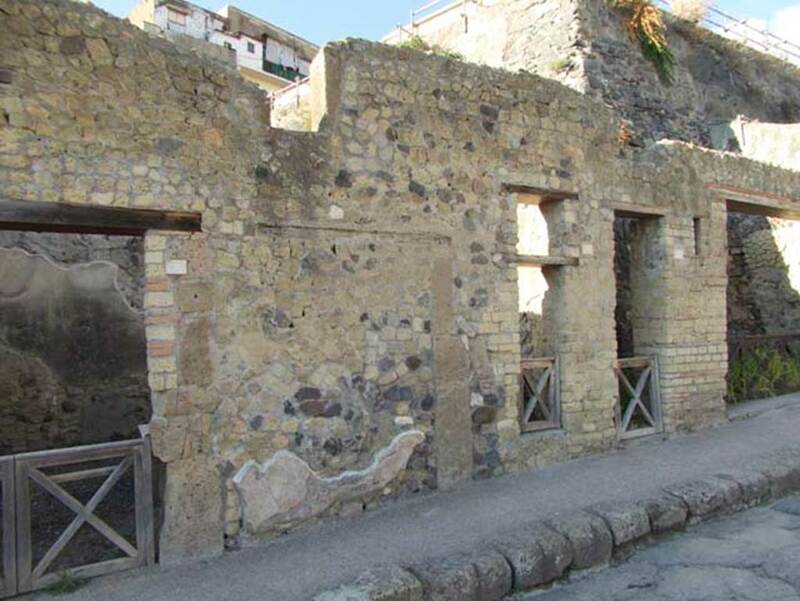 Herculaneum, past, present and future. London, Macmillan & Co. Ltd., (p.77-78). See Pagano, M. and Prisciandaro, R., 2006. Studio sulle provenienze degli oggetti rinvenuti negli scavi borbonici del regno di Napoli, Naples: Nicola Longobardi. (p.227-231 for various objects found in this area and found at differing heights during the excavation of the roadway). VII.5 Herculaneum. September 2015. Looking west to entrance doorway leading to steps to upper floor. 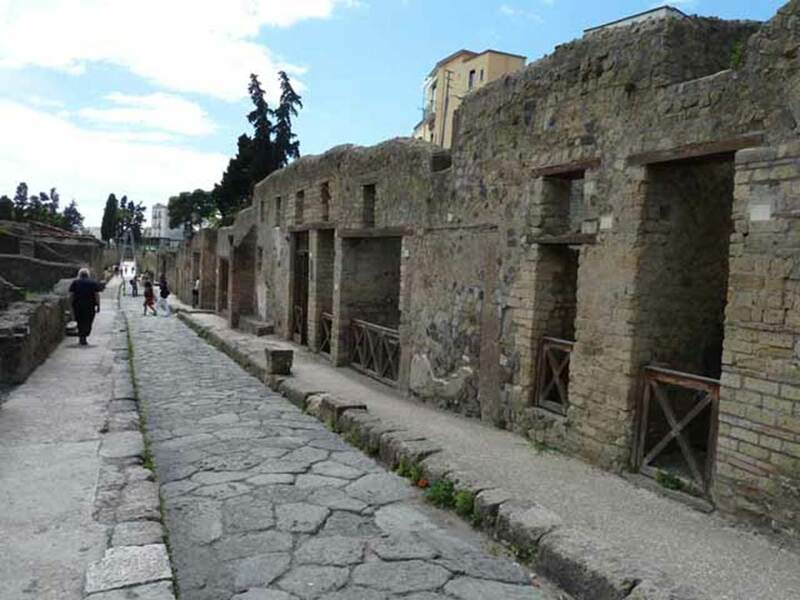 VII.5, on left, Herculaneum, and VII.6, on right. September 2016. Looking towards entrances on west side of Cardo III Superiore. VII.4, on left, VII.5 and VII.6, Herculaneum. September 2015. Looking towards entrance doorways.